The very first rock artist and one of its most influential artists overall, not just for setting the entire genre into motion with his debut in September 1947 but also for his multiple stylistic precedents that quickly took root and defined rock ‘n’ roll going forward. 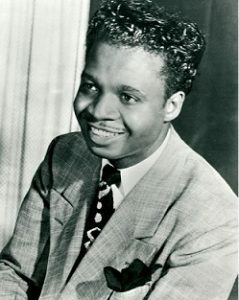 Born in New Orleans in 1925, Brown was steeped in gospel as a child but upon singing professionally in his late teens he gravitated towards pop crooning and was considered a gimmick in clubs for being a black singer who sounded white – much like avowed Roy Brown fan Elvis Presley was later singled out for being a white singer who sounded black. Yet in order to connect with audiences beyond the novelty aspect of his material in relation to his race, Brown began letting band member Wilbert Brown (no relation) sing bluesier songs, including one Roy had written, “Good Rocking Tonight”. When Wilbert fell ill at the start of one performance of the song Roy stepped in and reverted back to his gospel style, significantly altering the feel of the song and creating something entirely new. Signed in the summer of 1947 to DeLuxe Records his debut on record that September launched rock ‘n’ roll and scoring more than a dozen hits over the next few years he proved to be the ideal rock star – young, brash, a great singer and equally strong songwriter who boasted a tremendous stage show backed by a top-flight band (The Mighty Mighty Men) led by tenor sax ace Leroy “Batman” Rankins. From his unrestrained gospel-esque vocals in a decidedly secular – and somewhat profane – realm on uptempo romps to his cathartic emotional wailing in songs of romantic agony in ballads he laid the vocal blueprint for much of what followed. His lyrical cockiness was given free reign in his boastful songs which embodied the distinct perspective of the post-war black community in broader terms, setting rock apart from all other styles in terms of outlook. Brown’s early success also helped to make New Orleans the epicenter of rock’s first two decades, providing the impetus for record companies to sign other artists from the area which in turn ensured that the sound of the city would increasingly be spread nationwide. Though he lasted longer than most of the 40’s rock stars, hitting the charts for the last time in 1957 while the next generation of artists, among them Elvis Presley, James Brown and Jackie Wilson all openly borrowed Roy’s style, his own career was nearing the end of the line commercially. Forced for a time in the 1960’s to become a door to door salesman to make ends meet, Brown recorded sporadically over the next two decades, his career revived to a degree by acclaimed live performances with Johnny Otis early in the 1970’s which led to a new recording contract and his best selling records in twenty years along with a successful European tour. Before he could fully capitalize on the growing interest in rock history as it began to be more thoroughly documented in the 80’s the founder of rock ‘n’ roll died suddenly of a heart attack at the age of 55 shortly after a delivering rousing performance at The New Orleans Jazz Festival in 1981. Roy Brown’s vocal prowess, stylistic versatility, deep song catalog and massive influence along with his immeasurable impact for coming up with the components of rock in the first place and spreading the sound to masses with hit after hit in its formative years make him among the Top 50 artists in rock history, yet over time Brown never received the widespread historical acclaim for such a vital career.